After installing Windows 10/8.1/8 in express mode, list of active keyboard layouts in Windows is the same as in Mac OS X. But after logging in with Microsoft account, some of keyboard layouts disappeared, or new layout appeared. Same Microsoft account is used both with Parallels Desktop virtual machine, and physical PC. New keyboard layout added in the virtual machine also appears on the PC. By default, Windows synchronizes personal settings between all devices using the same Microsoft account, including keyboard layouts. Start virtual machine with Windows 10/8.1/8 installed. 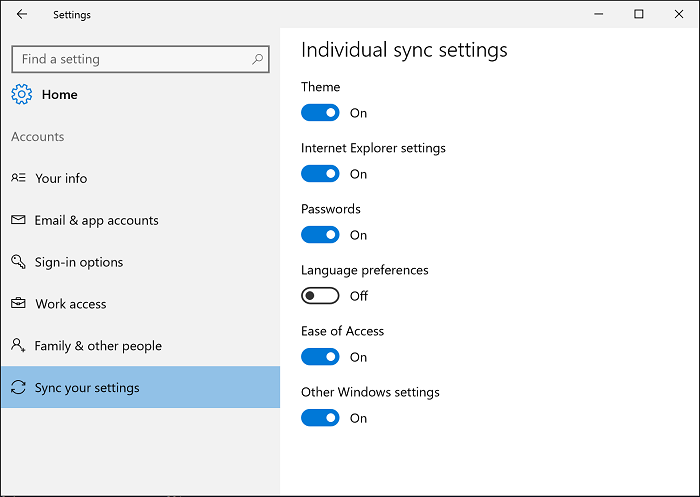 Disable synchronization of Language preferences in your Microsoft Account's Settings. Correct list of active keyboard layouts if required. Click on Windows Start button and select Settings. Go to Accounts -> Sync your settings -> Individual sync settings. Tap or click OneDrive, and then tap or click Sync settings. Turn off Language preferences pin. NOTE: Some keys on Apple and PC keyboards are placed differently. Parallels Desktop sets appropriate keyboard layouts during express Windows installation. These layouts will be mostly the same as in Mac OS X. You login with local account at the first time. When you login with Microsoft Account, Windows changes active keyboard layout list with one that is saved in Microsoft Account. All personal settings are synchronized by default. It is possible that some keyboard layouts will be removed and other added. This list will remain even if you login with local account later. You can disable Language preferences synchronization to be sure that keyboard layout list will stay unchanged.